Indian names: ber (Himachal Pradesh); pitni, ber, kandika, kandiari, singli, ban ber (Hindi); bari, konkamber, phitni (Kashmir); ranbor, uneb (Maharashtra); amlai, singli, simli, barari (Punjab). Wild ber is a plant of very common occurrence. It grows wild in forests and also on wastelands throughout the mid-hills up to elevations of 1,400 metres. The small acidic fruits are liked by children as well as by adults. A small spreading tree, with drooping branches; height, 5 to 8 metres; trunk girth, 85 cm; bark, rough, gray or dull black, irregularly cracked, covered with a thick layer of green moss in the case of older trees and, thus, looking green; branches, bearing at each node two spines, which are modified stipules; one spine is curved and the other is straight. Leaves, ovate, petiolate (petiole, 5 mm long), having very fine serration, 3.8 cm long, 2.9 cm broad, dark green and shining from above, white tomentose from beneath; venation, palmate convergent. Flowers, bisexual, hermaphrodite, cyclic, yellowish green; inflorescence, an axillary cyme, bearing flowers in a crowded manner; calyx, polysepalous, with 5 sepals, actinomorphic, greenish yellow, 2 mm long; corolla, polypetalous, with 5 petals, actinomorphic, white, 1.5 to 2 cm long; androecium, polyandrous, with 5 stamens, white, 1.5 to 2 cm long; gynoecium with two carpels, which are fused at the base, 1 to 2 mm long. Fruits, oblong, 1.3 cm in diameter, 1.45 g in weight, 1.05 ml in volume, colour marsh orange 013/1; pulp, Indian yellow 6/3. Seeds, wrinkled, stony, 419 mg in weight; volume, 410 microlitres; 1 seed per fruit. The flowering season was observed to range from the first week of June to the first week of July at Sanwara and in the adjoining areas. Similarly, the fruiting season was observed to be from the first week to the last week of December. The average yield of this species was recorded to be 9.5 kg per tree. The fruits contain 68.0 per cent moisture. Their pulp contains, 3.92 per cent acidity, 8.68 per cent total sugars, 6.73 per cent reducing sugars, 1.85 per cent non-reducing sugars, 1.72 per cent pectin, and 1.32 per cent tannins. The vitamin C content of this fruit is 2.56 mg per 100 g of pulp. The total mineral content of the fruit pulp, as represented by its ash, is 1.38 per cent. The protein content of the pulp is 2.56 per cent. Some of the mineral elements in the fruit pulp, viz. phosphorus. Potassium, calcium, magnesium and iron are 0.069, 0.583, 0.083, 0.065 and 0.006 per cent respectively. The fruits have emollient and expectorant properties. They are also considered to be cooling and an anodyne and a tonic. They are employed as an antidote to aconite poisoning and are recommended in nausea and vomiting. They are also prescribed in abdominal pain during pregnancy. They are used externally in poultices and are applied to wounds (Anon., 1976). The leaves are laxative and prescribed in scabies and throat troubles (Anon., 1976). 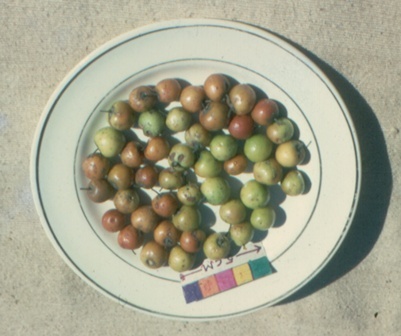 The small round fruits are acidic and poor in quality. They are, however, eaten by poor people, especially during scarcity. These fruits are eaten by villagers. The wood of this plant is very hard and durable and is used in making agricultural implements. The leaves of this plant are used as a fodder for sheep and goats.